We’ve spent the last couple of weeks in the office looking at a wide variety of different gaming glasses. We wanted to find out which pair was the best and why. After careful review, we’ve come to the conclusion that the Best Gaming Glasses are the J+S Vision Blue Light Shield Computer Glasses . The J+S model came out on top for a number of reasons: they offer almost complete blocking of that nasty blue light, while also being comfortable, stylish and durable as well. Below we’ll explain why we thought J+S produced the best pair, as well as what we liked and didn’t about the other pairs. When we’re writing product reviews or recommendations, we’re always trying to work out what users are actually hoping a product can do for them. That way, we can better determine whether a certain product will help fulfil that aim or not. There’s no point us going on about how stylish a product is, if the users are much more interested in whether it’s comfortable or not. To ensure that we’re judging a product on the right criteria, we look up the kind of things that customers commonly ask when thinking about buying a certain product. That way, when we’re testing, we know to look for. We determined this final list by taking the Gaming Glasses that fit this criteria, and then personally testing how well each of them stacked up compared to each other. Some of you reading this might not even be sure what blue light is. Or what the point of gaming glasses is for that matter. Allow me to explain. Blue light is a type of light that is emitted by computer screens. The problem here is that we’re not evolved to seeing bright light all the time. In the presence of bright light our bodies have evolved to produce hormones that keep you awake. This is because our bodies have evolved to think that the presence of light=daytime. Equally, when no light is present your body produces hormones which make you tired. Normally, this works fine. But when you spend your evenings sitting in front of a computer screen, staring intently into a bright light, you can often struggle to sleep at night. This is because your body still believes it’s the daytime. And has been busily producing hormones to keep you awake. That’s one of the problems with blue light. The other is that we didn’t really evolve to be staring into a bright computer screen for 10 hours a day. This can have negative effects on our eyes, leading to pain and dryness. Both of these issues are caused by the ‘blue’ light emitted by monitors and TV screens. 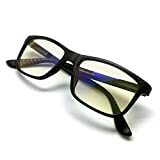 Therefore, the most important consideration for our users was the extent to which the gaming glasses blocked the harmful blue light from getting into our eyes. 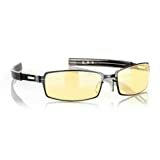 Glasses that do this properly, will enable you to game for longer, without having eye strain or feeling the need to stop. You’ll probably play better too! They’ll also allow you to sleep soundly after your gaming session. No more staring at the ceiling after a late night session wondering why you can’t sleep. 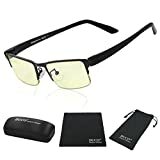 Obviously you don’t have to use then while gaming, whether you’re a writer, or a developer, anyone who spends lots of time in front of a screen would benefit from a pair of gaming glasses. Therefore, the most important consideration when looking at gaming glasses, is just how well they block blue light. If they don’t, then they’re no better than a normal pair of reading glasses for gaming. Sometimes, you’ll put on a pair of glasses and they just won’t be comfortable to wear. They might be too heavy, too tight or sit painfully on your nose. It doesn’t really matter why they’re uncomfortable, just that they are. The thing is, if they’re uncomfortable, you just won’t wear them. No matter how well they block out blue light. No matter how durable they are, or how stylish they look. If they’re uncomfortable to wear, you’ll find an excuse not to wear them. With that in mind, comfort is incredibly important. If they’re not comfortable you’ll never get to enjoy any of the other benefits anyway. This is particularly important for gamers considering the amount of time they spend in front of their computer screens. There’s nothing worse than buying a brand new product, only to have to it break after just a couple of days use. This is a particular problem for glasses, given just how fragile they tend to be. They’re very easy to accidentally sit on and completely ruin. So it’s important that gaming glasses be as durable as possible. Tougher models will be less susceptible to breaking randomly, and much more likely to survive accidental collisions with your foot or backside. This will save you both frustration and money. Style is something that is largely personal, and so what looks good to one person might not to another. However, almost everyone agrees when something looks silly. The last thing you want is to get a pair of gaming glasses that turn you into a laughing stock. Although most people only wear gaming glasses in the privacy of their own homes, some users do choose to wear them pretty much permanently, such as when at work. They benefit by way of better sleep and less eye pain. If this is something you’re considering, then it’s important that your glasses look sensible enough to be worn around the office, and not like something out of a Sci-Fi adventure. Otherwise, once again, you simply won’t wear them. Obviously no one wants to pay more than they have to, and this is no exception with gaming glasses. However, we found that most of our users were less concerned about how much they might have to pay to get a good pair, and more concerned about how well each pair actually worked and how wearable it was. Essentially, they were more interested in how much the gaming glasses would benefit them, than they were about the price. This is probably because most users think that eye pain is an inevitable part of computer use, and when they discover there is a solution, they are prepared to pay a little more in order to get it. So while we made sure to exclude unnecessarily expensive models, we didn’t exclude excellent ones just because they were a little pricier. Our pick for the best gaming glasses is the J+S Vision Blue Light Shield Computer Glasses . The reason these are so good is because they perform so well in each of the criteria we looked at above. According to the manufacturers, the Vision Blues block out 90% of blue light, while still letting in a small amount of less harmful blue light in order to improve vision quality. The effect of this is brilliant, I was able to game and use the computer for hours on end without suffering any of the eye pain I usually get when staring at a screen for long periods. In addition, I was able to sleep much better than I do usually. I can only really put this down to wearing these glasses while using the computer. As nothing else had changed in my routine. In terms of comfort, all the members of our team found the J+S Glasses to be easy to wear, and had no problem having them on for long periods of time. Obviously some people’s faces are wider than others and there’s all sorts of factors that affect how comfortable a pair of glasses will be. But we had a wide range of people try out the glasses, and everyone classed them as being pretty comfortable. The Vision Blues are made out of a dark plastic and strike me as solidly built and pretty tough. They weight around 3.2 ounces, which is heavy enough to avoid feeling flimsy, while not sitting too heavily on your face. In terms of style, these glasses have a more classic look to them. While they’re probably not going to win you any fashion awards, they also aren’t going to attract any negative attention either. I rather like the way they look, very geek chic. Finally the price is very affordable, while they’re not the cheapest set of glasses we’ve looked at, neither are they the most expensive. They also come with a 1 year warranty, and a 30 day money back guarantee. This combination of features makes the J+S model our pick for the best gaming glasses available. This AV model is seriously good, and seriously cheap too. Just like the Vision Blues, its lenses block out 90% of blue light, creating a much improved playing experience for gamers, and also helping to fight insomnia. The AVs also look great and have a slightly more slim lined appearance than the Blues. It’s basically a matter of personal preference as to which one you think looks better. I found them a little less comfortable, and more fragile than our number one pick, and that’s the primary reason why these glasses have missed out on the top spot. 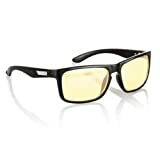 However, they’re still an excellent buy, and if you fancied getting a cheap pair just to see if gaming glasses are for you, then you wouldn’t go wrong with these. Gunnar are considered to be the premium brand in the gaming glasses sphere. They’ve been producing glasses for quite a while and are very proud of their patented lense technology. As you might expect, their products are excellent, and the PPK is no different. It comes in a wide variety of colors and styles which is a nice touch, and the entire range looks good. Gunnar don’t tell you exactly how much blue light is blocked by the PPK, but it does an excellent job of keeping your eyes comfortable, so presumably it’s keeping out quite a lot. For me the comfort was great, but some other people in the office found that they couldn’t get the PPK to fit their faces very well, and it would slip off or just sit there awkwardly. This isn’t something that happened to me, but might be worth thinking about before buying. I also think that the PPK is a little expensive compared to some of the other models that do pretty much the same job. While it’s a great piece of kit, it does seem quite pricey when compared to the AV or the Vision Blues. The Intercept is another lovely option from Gunnar. It looks great and comes in a variety of different colors, although if you’re thinking of wearing them around the office then you’ll probably want to stick with either the standard black or a dark blue. Like with the PPK, Gunnar doesn’t really tell you exactly how much blue light is blocked out by the lenses. But they definitely relieve eyestrain, so we can assume they block the vast majority of it. The only downsides to the Intercept are that the frames are quite fragile, and the price is over double of some of the more economical lenses. But if you like the look and want to pick up a pair they’d be a great investment. These are a stylish set of glasses with one glaring issue (pun unintended). As we’ve mentioned above, style when it comes to glasses is largely subjective. These have a different look to some of the other pairs that we looked at, but I really liked how they looked and they fit very comfortably on my face as well. They also seem to do a good job of removing blue light by greatly reducing my eye strain. Having said that, the one annoying feature is that you can see a faint reflection of your own eye in the lenses. This means that whenever you’re wearing them, you’ll be distracted by your own eye staring back at you. It’s not a huge problem, but it’s enough that I rank these lenses at the bottom of our list. The J+S Vision Blues were definitely the best set of gaming glasses we looked at, and we had no choice but to give them the number 1 spot on our list. They combine comfort, style and effectively block out blue light too. If that wasn’t enough, they’re also pretty affordable and almost half the price of some of the more expensive alternatives. Even though the Vision Blues were the winners, all of the glasses we looked at were pretty excellent, and you’ll get great eye protection no matter which one you buy.